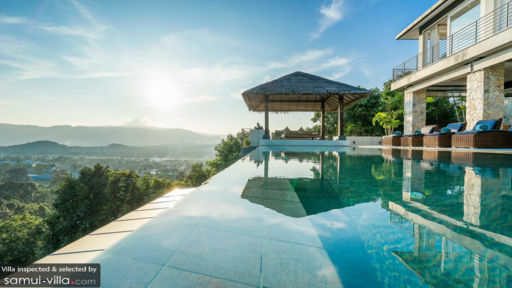 Found on Chaweng Beach, Samui, Baan Kimsacheva is a contemporary home featuring tropical elements to give guests a sanctuary overlooking the ocean. With six bedrooms, the villa is perfect for family gatherings, get-togethers with friends, and private events. A prime location on the beach allows you to explore the town with ease and even head to nearby islands. 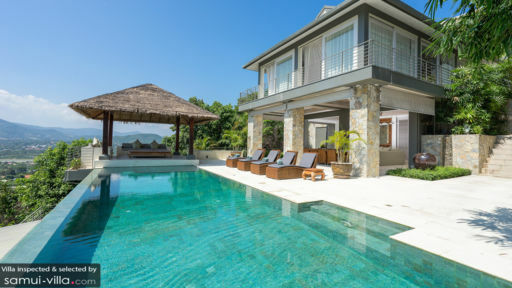 Spread across several levels, the villa offers a 15-metre infinity swimming pool, beautiful landscaped gardens, splendid vistas of the ocean and tropical flora, and more importantly comfortable living. Baan Kimsacheva boasts of six bedrooms that are located three above the main living area, and three guest bedrooms below the pool level. Each bedroom is furnished with double beds and features en-suite bathrooms along with air-conditioners. The master suite is located upstairs with two sides opening out to the veranda for ventilation and splendid views. The bedroom has an en-suite bathroom that leads to a courtyard fitted with a terrazzo bathtub. Each of the other five bedrooms is fitted with necessary amenities and en-suite bathrooms offering a convenient, exclusive, and private experience to guests of the villa. As you make your way to the pool area, you will be greeted by a breathtaking view of the dazzling ocean and tropical vegetation that can be enjoyed from the 15-metre swimming pool. The stunning pool is flanked by a pool deck that is furnished with sun chairs for lounging and sunbathing. Right on the edge, there is a traditional sala with a lounge fitted with sofas, from where you can view the sunset as the sky changes colours from blue to orange and red! There is a poolside lounge with rattan seating behind the pool deck as well, perfect for an alfresco BBQ with guests. The main living space is above the pool deck and can be reached via steps outdoors. There is a large space that has been whitewashed and features two seating areas, one that is for relaxing with white couches, and another that is a TV lounge with a plasma-screen TV showcasing 56 international channels. The living room is definitely cosy and warm so guests can enjoy spending time with friends and family as they enjoy a mesmerising view of the neighbouring areas. There are massive armchairs to snuggle up on while watching your favourite TV show or film. Outdoors there are beautiful gardens, ponds, and water spurting out from a polished-black urn for a zen-like ambiance. The dining area and kitchen is on the same floor as the swimming pool and pool lounge thus, offering alfresco dining to guests to enjoy the fresh breeze while relishing the delicious food. A 10-12-seater dining table with rattan chairs is found on the deck, and a fully-equipped all-white kitchen is found indoors featuring all amenities and modern appliances you could need for your meal preparation. The villa caters to the needs and requirements of each of its guests to ensure their stay is one that is smooth and memorable. The live-in housekeeping staff provides daily services that can be extended upon demand. If you wish, a profession Thai chef can be appointed to serve you with the best of Thai and international cuisines for all your meals! There are plenty of services available upon request including car rentals, in-house massages and spa treatments, and tours around the island. Baan Kimsacheva is located in a convenient spot near Chaweng beach, just a five-minute car ride away. There are restaurants, bars, and beach clubs that you can explore and you can even head to the night markets to buy trinkets or indulge in some delicious street food!